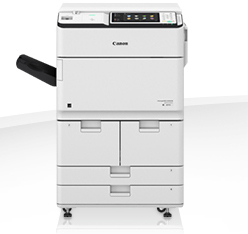 Take a more detailed look into the Canon imageRUNNER ADVANCE 6555iPRT. The imageRUNNER ADVANCE 6555i PRT has been designed to address businesses’ various costs related to print, from the direct costs associated with the device and consumables, to the more subtle, but equally important claims on your resources related to device administration, IT support, and user time and effort required to create and output documents. The modular design enables you to optimise your investment by configuring a device that meets your exact requirements. You can control user access and rights, while having visibility of usage per device and user through activity tracking reports. Print policies can be set to restrict access to specific functions by user to control costs further. Tight integration with output management solutions such as uniFLOW provides the ability to save more through cost recovery and allocation. Efficient Device Management tools reduce the administration burden of your fleet, while its award-winning* capabilities for print publishing allow end users to quickly combine documents and apply finishing for efficient document creation and output. These aspects all help to reduce cost and save time. Easily setup, manage and apply security hardening policies and settings in one place, for example, disable USB ports or enforce secure print for all users. You can control access to the device to prevent unauthorised usage and even restrict functions by user for stronger security. Secure print, mailbox as well as secure erase of jobs and full Hard Disk Drive encryption are available as standard to enhance document confidentiality. IP and MAC address filtering protects your network, while IPSec secures the transfer of information to and from your device. A variety of optional features for device, network and document security enables compliance to the highest standards, covering all aspects of information security. The additional option of uniFLOW offers further efficiencies and security through secure My Print Anywhere job release as well as Data Loss Prevention of prints. Native support for industry standards such as Genuine Adobe PostScript and PCL, ensure seamless integration into networks and enterprise solutions. Consistent operation and management with the imageRUNNER ADVANCE portfolio, combined with an extensive range of centralised capabilities for device and fleet monitoring and administration, including automated meter capture and consumables management as well as the ability to pre-configure devices and fleets prior to onsite installation, all help reduce the burden on your IT resource. Once installed you can efficiently configure, manage and upgrade your device whether individually or as part of a larger fleet. The imageRUNNER ADVANCE 6555i PRT has a robust design and engine with a maximum paper capacity of 7,700 sheets, enabling the effortless processing of large workloads. With fast output speeds, advanced greyscale capabilities, and versatile finishing, which ensure superb and dependable results time after time, it is perfect for the requirements of busy workgroups. Through Canon’s remote tools for diagnostics and assistance, your service provider will deliver proactive and fast maintenance and support, ensuring reliable uninterrupted device operation and maximum return on investment for you. The responsive large colour touch-screen with flick and pinch functionality common with smartphones, intuitive menus and the possibility to create user-specific workspace through personalisation provide unique user experience with simple operation. A built-in tutorial and support videos assist with basic maintenance to maximise uptime. A range of intelligent features helps to streamline document workflows and maximise productivity, such as motion sensor technology, which wakes the device from sleep mode to reduce the perceived waiting time. Tight integration with a range of powerful output and information management software optimises your document processes, thanks to the smart MEAP and MEAP web application platform. Flexible mobile working solutions and support for industry standards, used alongside embedded Wifi capabilities and the option for Near Field Communication, make it easy for mobile workers to print from their mobile devices. The imageRUNNER ADVANCE 6555i PRT works with almost any smart device, with support for common applications such as Google Cloud Print and Mopria, and can connect directly to a range of cloud-based services. The imageRUNNER ADVANCE 6555i PRT offers advanced finishing options, such as stapling, booklet printing, document insertion, hole punching as well as C and Z folding. This, coupled with Canon’s iW Desktop publishing software provides simple creation and production of high-quality professional-looking documents, in-house. The new staple-on-demand functionality make finishing easier than ever before. This ENERGY STAR® qualified device offers a class-leading TEC** rating and consumes 0.9W or less in sleep mode. Various technologies including on-demand fixing, motion sensors, remote and scheduled shutdown capabilities and quiet finishing equipment improve working environments and contribute to energy efficiency. The imageRUNNER ADVANCE 6555i PRT is built using bio and recycled plastics for certain parts and in addition to this the new Eco stapler binds paper together without the need for metal staples, therefore reducing waste yet further. Demonstrations available on all photocopiers and imageRUNNER ADVANCE printer's upon request.